Back in good old Ottawa after a great conference. Saw some fascinating talks and met many very interesting folks. Came back and saw New York is going to take another swing at Big Food. City health commissioner Thomas Frieden has reworked the regulation following the original's defeat in appeals court. The regulation would only affect restaurants of 15 chains or more thus sparing smaller mom and pop establishments the cost of determining Calorie counts and making menuboard changes. The defeated regulation had only applied to those restaurants that already had posted information online or in brochure form. The new one applies to any chain with 15 or more locations regardless of whether they've already posted Calories. Remember, Big Food won the case not because of their fabulous arguments (like the one that says that it'd be too confusing for consumers to understand the new menus like the one above from Subway), but rather because it broke some federal statute. I'm guessing that without an Arnold-style veto, this one's going through. 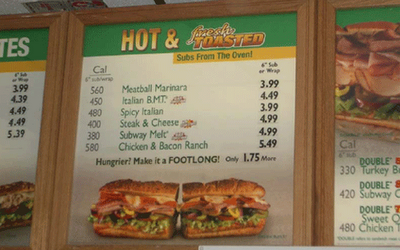 Quiznos must not be thrilled.